We’re all for effective advertising, which is why we wince sometimes seeing major publishers over-clutter their homepages in a desperate attempt to juice ad sales. 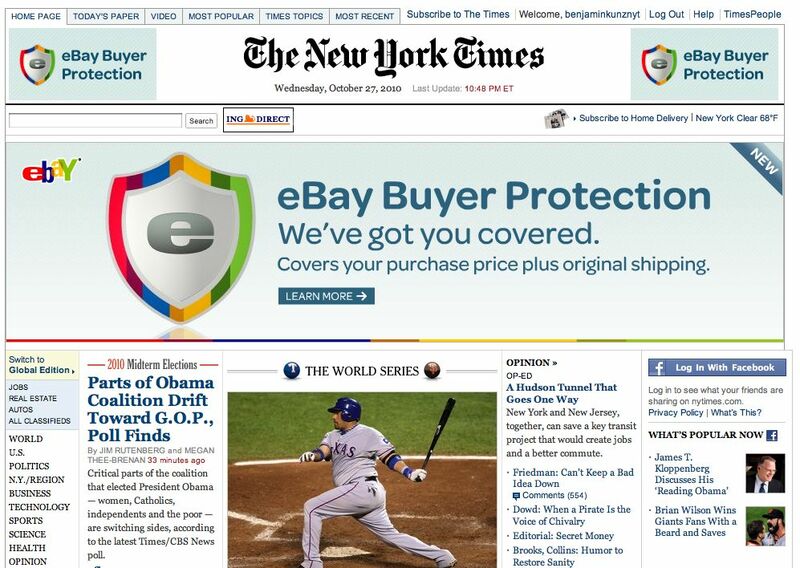 Take NYT, which sold about 39% of its visual real estate to eBay with this massive trifecta banner concoction. Yes, you can’t help but notice it. 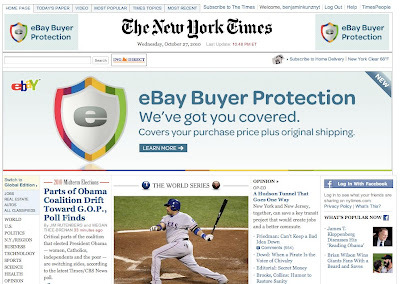 Yes, CTRs and conversions may go up, giving eBay’s current campaign a little squeeze for its cost per acquisition. But what does this do to the total ecosystem of advertising in general? Are you, dear reader, enjoying this view? A few years ago, Clear Channel radio got a bit (we’re hypothesizing only here lawyers and this certainly can’t be true) greedy and jacked up the minutes of commercials per hour. Ratings fell, and Clear Channel was forced (again, conjecture!) to launch a “less is more” campaign, promoting the fact it now ran less spots per hour. This is a common pattern in communication networks. Car salemen were overly aggressive until automakers installed consumer surveys and learned distributors should back off. Telephones were encroached by marketers until consumers got pissed about telesales and all signed up for the Do Not Call lists, vaporizing that industry. And way back in the 1960s TV shows ran only 9 minutes of commercials an hour, while today broadcast stuns you with about 18 minutes — so is it any wonder now that younger generations are rushing to Hulu to watch shows with limited commercial interruption? The sad reality for advertisers is they intrude upon a group of consumers whose majority doesn’t want the interruption, so some mutual restraint is required to make the model work. Direct mail may be the next victim of failure, if over-encroachment gets enough consumers to clamor for a “Do Not Mail list” (we’d link to it except we fear it might destroy the United States Postal Service). If every individual marketer or publisher goes for maximum selfish yield, they damage the entire advertising community, just as John Nash’s game-theorying laddies hitting a bar all go home without a date if they all try to hit on only the single prettiest girl. Group collaboration is required to optimize the yield on any ecosystem. Individual salesmen screaming for more dollars today may get the gold watch, but burn out their future. So. Dear New York Times, we love you, but keep it up, and you’ll be done with print and HTML, posting news only to your millions of Twitter followers who prefer 140-character updates with no commercial interruption. Your online traffic is down about 20% since the height of Obama’s inauguration. Your Twitter followers now surpass your printed circulation. Is this the path to building a monetizable audience?